On October 12, we met in London Maria Parsons, Margaret Melling from MM Consulting, Penny Thewlis and Diana Roberts from Age UK. The meeting was mediated by our Young Foundation partners Lucy Kimbell and Kat Jurgnickel. Our aim was to have feedback from a group of users playing an important role in the Ageing controversy, in order to get a consistent assessment on the analyzed data and on the graphic solutions of the latest visualizations. 1. What is living well with dementia? 2. 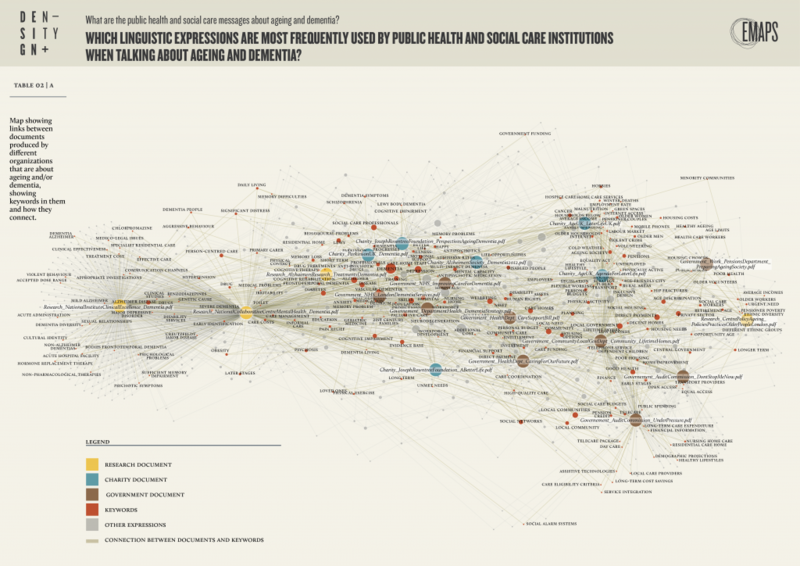 What are the public health and social care messages about ageing and dementia? 3. Are older people assets or deficits? Each issue had been studied by Sciences Po in order to focus better on data available on the net, through digital methods, and formulate more specific questions. Q1: What is living well with dementia? a-Which online resources aim at helping people to live well with dementia? The first set of data was built with the aim to understand which resources are available online to help older people with dementia. Sciences Po selected then a list of dementia-related blogs run by elderly people living in UK. 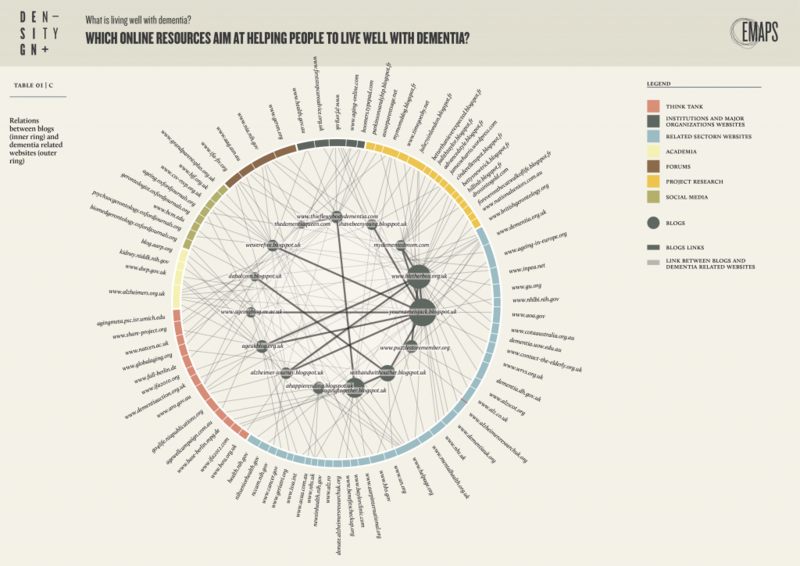 This first visualization shows the links between these blogs. PROS: Users demonstrated a certain interest in this map because it highlights the connections and relationships between blogs, which wouldn’t be immediately understandable while netsurfing. CONS: Unrelated blogs were presented as a separated list, which was interpreted as a legend at first. As a second step we showed the same set of data spatialized with Gephi. PROS: Most of the users expressed a preference for this visualization because it emphasizes clusters while connections are easier to read compared to the first graphic solution. CONS: One of the users remarked that this type of representation looks chaotic and complicated; she compared it to a spider web. In the following step the blogs in the corpus have been crawled in order to build a second, wider network. Since the results of the crawl were not yet available, we built a sample dataset and used it to develop different visualizations. - Table 2 (tree map): This kind of representation isn’t easy to understand for those who had never seen it, while those who could already read it, aren’t able to compare the areas size. Q2: What are the public health and social care messages about ageing and dementia? a- Which linguistic expressions are most frequently used by public health and social care institutions when talking about aging and dementia? 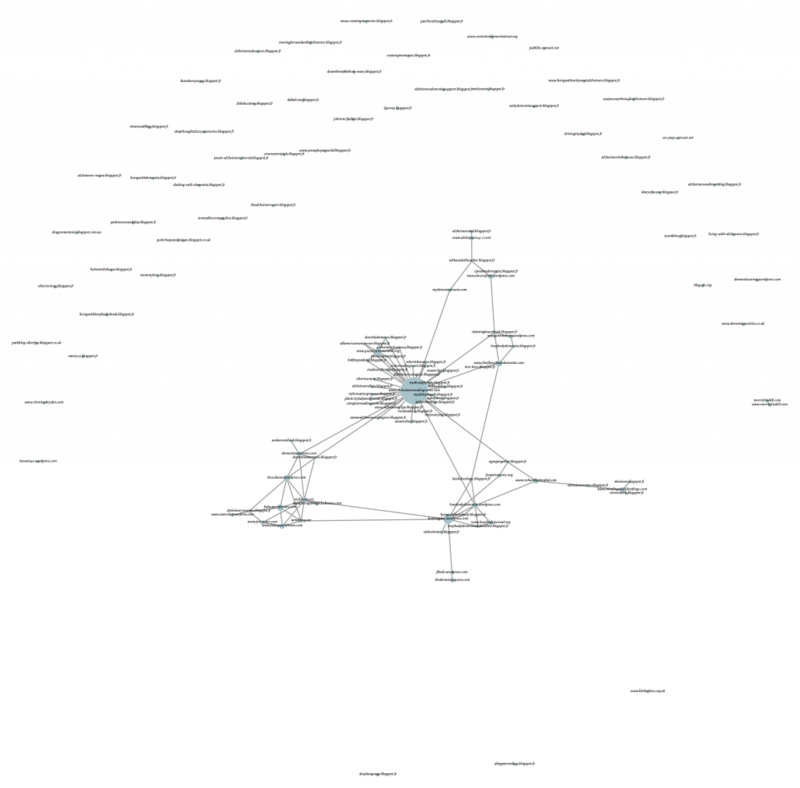 This visualization shows a bipartite network between documents and keywords. It’s the result of a semantic analysis of Ageing and Dementia related documents provided by the Young Foundation. 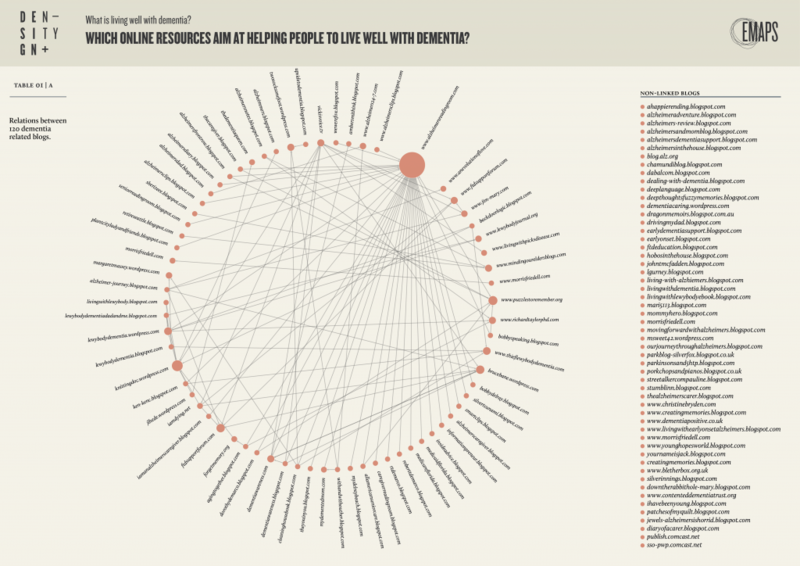 The visualization highlights the most important keywords and their links to the documents. PROS: Users seem very interested in the network, although they didn’t immediately understand it. However the visualization could potentially be useful. Thanks to the mediation of Mrs. Parsons, the other users were able to find the clusters and to explain us the closeness of some keywords to the documents. They also suggested to create a similar visualization to show the evolution of blogs and websites over the course of time and to build interactive visualizations to favour the exploration of the data. - At a first glance they couldn’t understand the difference between a network and a tagcloud. One of the users referred to as the biggest node of the network as a“big centre of something”, without understanding the structure of the visualization she was watching. - They didn’t understand the spatialization made with Gephi, they erroneously thought that only the documents and the keywords in the center of the network were important. - They tried to follow the links but they expressed some confusion. On the basis of their feedback we think it would be useful to create a guided exploration of the maps, helping users to read them. One possible solution could be to create some overlapping levels that explain the data collection process and the creation of the network. Q3: Are older people assets or deficits? 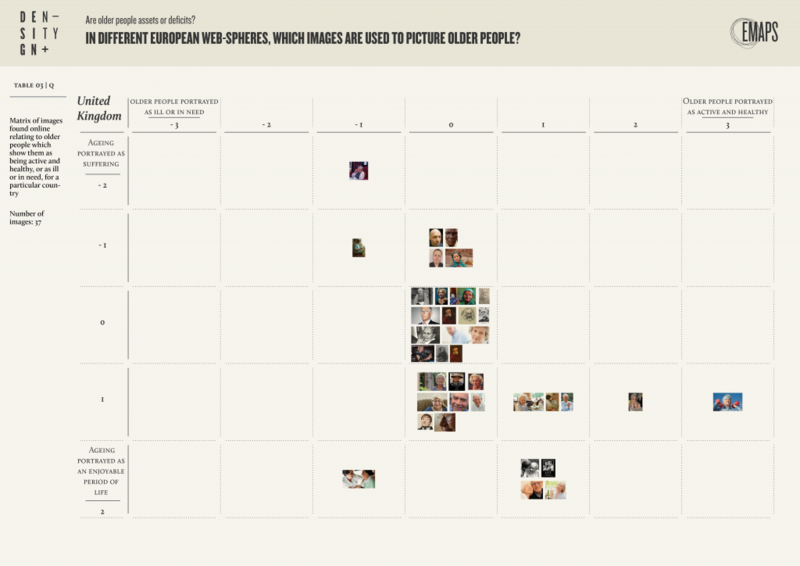 a- In different European web-spheres, which images are used to picture older people? 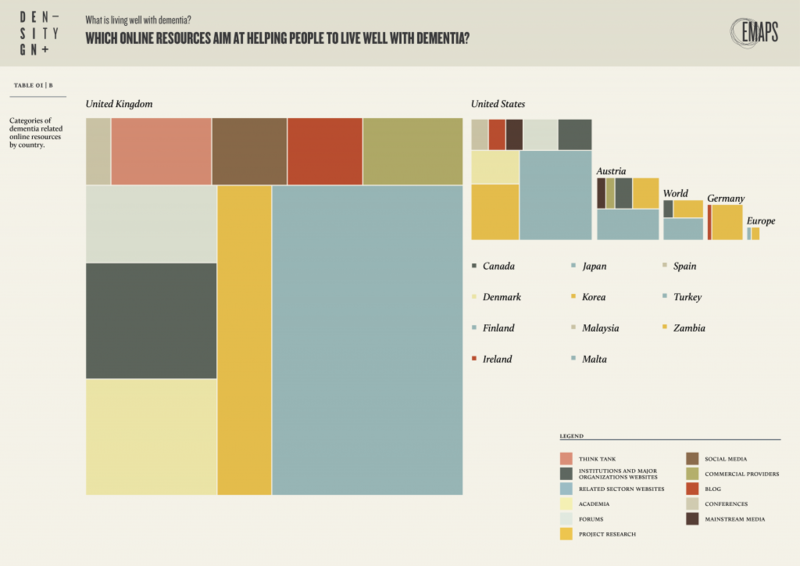 This third set of visualizations aims to show the results of a search on Google Images. The data were collected from Sciences Po, using “Old Age” as a query translated into various languages and searched in the different national domains of Google. PROS: They thought it’s useful to understand how people with dementia are represented and it could be useful also related to other media. CONS: -They expressed their interest for the visualization, but they didn’t look carefully at the pictures or compare the results in different countries. They showed some difficulty in understanding the importance of this set of data in relation to their work and they couldn’t tell if the classification made sense. Users were very fascinated by the possibility to obtain data from the web, to create relations and visualize them, making information accessible to the public. We noticed that users were interested in the data only when they were explicitly involved or represented in the visualizations. One of the users underlined the importance to promote a collaboration between the stakeholders, and to create a dialogue between who collects the data and the final users to make visualizations answering their needs. This experience remarked that the only way to understand the real effectiveness of the diagrams is to observe users interacting with them, while direct questions about the meaningfulness of the maps don’t lead to a reliable feedback. This entry was posted by Milan on Monday, October 22nd, 2012 at 9:28 am. It is filed under Events. You can follow any responses to this entry through the RSS 2.0 feed. You can leave a response, or trackback from your own site. Thanks for writing up your findings from the Oxford workshop we all created. I find it really helpful to read your notes and observations about how the issue professionals responded to the maps, and to see them as well on this blog. For me, some of the questions in the project are getting clearer – how what we might call ‘use’ of the maps is importantly tied to their visual communication design (and future interactions in the digital versions you have suggested) but also the questions and data that each map brings into view, and the use context or task in which a person is engaging with a map, and also their habitual practices of engaging with representations of data of different kinds. Great post, really really interesting. A little question though can you expend a little bit the remark “users were interested in the data only when they were explicitly involved or represented in the visualizations”. This is potentially very interesting, but I am not sure of what that means exactly. My impression (both in London and Oxford) is that when people find themselves, their organization, or in general something that they know, they are naturally led to try to read the map. It works as a custom “access point” to the map: people use what they know as a key to decode/validate the map. © 2012 EMAPS | Powered by WordPress | Theme 'Sirup' by 1000ff | 38 queries 0.216 sec.